As you may remember, Agents of Field have supported the campaign to Save Farm Terrace allotments since it began back in 2012. Our own veg plot is at a neighbouring allotment site just down the road from Farm Terrace and the plight of Sara Jane Trebar and her fellow plot-holders was something we very much took to heart. I blogged about their campaign back in July and also reported on the Save Farm Terrace protest which I attended at the Royal Courts of Justice in central London later that same month. At the time of the court hearing, we were advised that a decision would be forthcoming the following week. However, as the weeks became months and still no decision was announced as to the future of the allotments, we had become increasingly doubtful that the outcome would be a positive one. 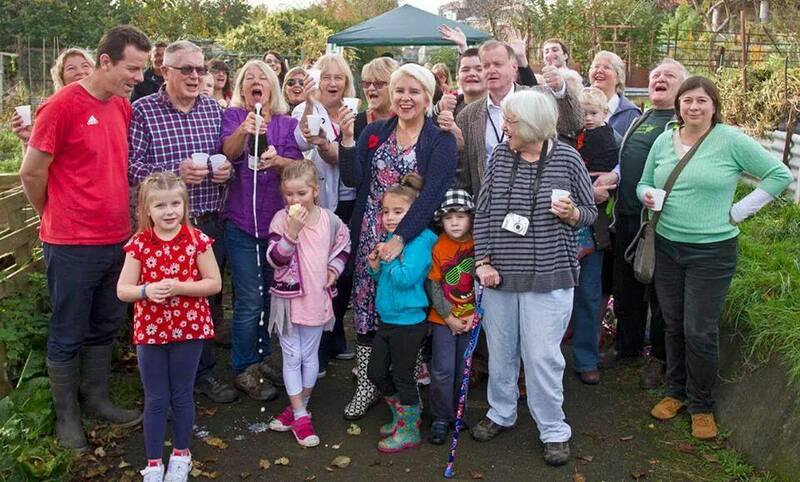 However, last Friday, 31st October, the long-awaited announcement came that the High Court has quashed the government-approved council plans to turn the allotment land into flats and a car park; Farm Terrace allotments are saved! Photograph used with permission of Sara Jane Trebar. We’re thrilled with this news, not just because Sara Jane Trebar and her team have fought so tirelessly over the last two years and they wholeheartedly deserved to win, but because this is a landmark victory that could have important implications for other allotment sites threatened with closure up and down the country. Perhaps most importantly however, it’s an encouraging reminder that the little guy can take on the big bullies – and win. The full press release from the Save Farm Terrace campaigners can be viewed here. Great news! So encouraging to know that big bullies don’t always win. I look forward to my Agents of Field reports – always interesting, witty, and very well written pieces. Glad they won! There are plenty of other places to build – why not renovate or encourage people to move to Leeds, which is full of unused new build flats? Yes, it certainly irks us that allotments are commonly regarded by councils as expendable luxuries when they’re not – they’re essential green lungs which provide innumerable socio-economic benefits to our communities and getting rid of them will only put further strain on our hospitals, health centres and police departments, not to mention the environment.